Matakauri Lodge offers luxurious accommodation, fine dining, superb service and stunning panoramic views. * This product is priced in New Zealand Dollars (NZD), AUD rates can fluctuate depending on exchange rates, final rates in AUD will be confirmed by your consultant at time of booking. Available for new reservations until October 31, 2019. Conditions apply, cannot be combined with other offers. A 4 night minimum stay is required. Packages are subject to change and availability. Book four nights and let Matakauri Lodge take care of your last night as part of this limited time, value offer. 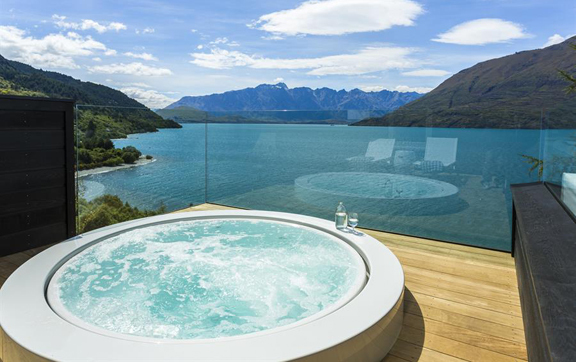 An exclusive retreat on the banks of Lake Wakatipu, Matakauri Lodge enjoys a spectacular mountain panorama and is superbly located just seven minutes’ drive from Queenstown. Within easy reach of charming vineyards, ski fields and all the adventure sports and outdoor activities the town is famous for, you will quickly fill four days in Queenstown. What’s more, with just one night guaranteed to leave you feeling rested, four nights at Matakauri Lodge in the accommodation of your choice is sure to leave you feeling rested and rejuvenated. *Based on published rates. Available for new reservations until October 31, 2019. Conditions apply, cannot be combined with other offers. A 4 night minimum stay is required. Packages are subject to change and availability. The 4 Villas and 3 Suites at Matakauri Lodge feature a combination of spacious lounges with comfortable sofas and chairs, king size beds, fireplaces and extra large bathrooms which are luxuriously fitted with two person baths, tiled under-floor heating, and shuttered windows. Each Villa and Suite has its own private garden terrace that looks out to mountain and lake views and each is complete with every modern convenience, including satellite television with teletext, double phone lines, CD player, hair dryer, pure wool blankets, bar, fridge, and tea and coffee making facilities. The three Suites are within the main Lodge building. All suites include underfloor heating and reverse cycle air conditioning to ensure total comfort for all seasons. King-size twin set beds are furnished with the finest quality linen and feather and down pillows. Private outdoor terraces offer panoramic views of the lake and mountains. This ground floor suite with an east and west courtyard catches the first and the last of the day’s sun. It has a separate lounge with extensive views of Cecil and Walter Peak. This suite is also designed to cater for the special need guest, so you can find an extra large shower. This two bedroom, two bathrooms, loft style suite includes an additional separate toilet, a terrace, a balcony and an extra large lounge with uninterrupted views of the Remarkables Mountain Range to Walter Peak. 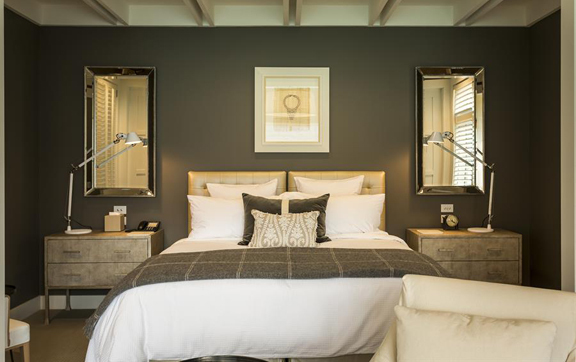 The main bedroom is on a split level with ensuite which includes double shower twin vanities and a two person spa bath. The second bed room is a smaller, loft style bedroom which has an ensuite, but no separate lounge area. This upstairs suite features a separate lounge, ceiling-high picture windows with views from Cecil to Walter Peak. The spacious private terrace opens on to landscaped native bush gardens. The large bedroom overlooks the terrace and the separate bathroom has a shower and deep two person bath. A short walk through the native bush from the main Lodge, the 700 square foot Villas offer the ultimate in space and privacy. A separate lounge with open log fire, large window seat, and private outdoor terrace enjoy 180-degree panoramic views of the lake and mountains. Also taking in the panoramic views are the extra large bathrooms featuring twin vanities, double showers, heated towel rails and extra large spa baths. King-size twin set beds are furnished with the finest quality linen and feather and down pillows. Underfloor heating and reverse cycle air conditioning ensure total comfort for all seasons. Nestled in native bush overlooking Lake Wakatipu, Matakauri Lodge, one of the world’s most private and serene vacation retreats, is a short distance to Queenstown, the alpine wonderland of New Zealand. Matakauri Lodge offers absolute comfort as well as stunning panoramic views. The Lodge and its adjoining villas are luxuriously appointed and have been designed to be in harmony with the lakefront environment and surrounding bush. Matakauri Lodge is unique … the first luxury lodge to open in the new Millennium in arguably the world’s finest destination resort, Queenstown . It is one of New Zealand’s most private and serene vacation retreats, nestled among bush on the edge of Lake Wakatipu, just 10 minutes drive from Queenstown. Moments of peace and tranquility may be found in a stroll along the lake, reading an engrossing book in the library, or simply listening to the sounds of waves lapping the shore, enhanced by birdsong and the gentle whisper of a breeze rustling through the leaves. Fresh clean mountain air and breathtaking beauty complete this ideal recipe for total relaxation and renewal. Guests enjoy a variety of facilities including the Spa Pavilion with sauna, outdoor hot tub and exercise room. Relax at Matakauri is an exclusive program of tailor made yoga and massage sessions all enjoyed in the comfort of your own villa or suite. Relax and unwind in the peace of these tranquil surroundings. Feel rejuvenated on your journey to total wellness and balance by a healing treatment in Matakauri Lodge holistic Spa. ” Prescriptives ” exclusive use of natural ingredients maximise the therapeutic value and may include cinnamon quills, star anise, crystal sea salt, the legendary NZ organic manuka honey, seasonal fruits and flowers, green tea, rice flakes, live natural yoghurt, wheatgerm, ground flax seeds and unhulled sesame seeds. Personalised Prescriptives may start with hand and foot massages- a fabulous pick me up, or individually agreed face, skin and body polishes, masks moisturising and massage programs. Prescriptives ‘signature experiences’ are a full or half day of personalised holistic body,mind and spirit care. Or a prescriptive bath in room, scented and softened with specially prepared blends of organic aromatherapy oils, fresh flowers or herbs to stimulate, relax or detoxify. Perfecting the fine art of the dining experience, the staff at Matakauri Lodge will arrange an elegant setting to suit your mood, be it outside under a majestic sunset accentuated by breathtaking views, caressed by the dining room fireplace, secluded downstairs in the cosy and intimate wine cellar or in the privacy and relaxation of your own suite – the choice is yours. Matakauri Lodge exquisitely prepared meals feature a wonderful selection of fresh seasonal products. An equally splendid selection of award winning local wines compliment the meals. Sumptuous desserts and hearty breakfasts are also trademark house specialties. The library is within easy reach of all the villas and suites. Not only is it well stocked with a vast collection of interesting books/ magazines but there are also a splendid video and a CD collection which are available to guests to enjoy. Time to catch up on a game of chess or even a chance to learn. Relaxation and good wine go hand in hand. Matakauri Lodge prides itself on a magnificent collection of award winning New Zealand wines. If you wish to surround yourself in the world of wine, why not take dinner within the wine cellar.